Balinese house (kuren) consists of a family or a number of related families living within one enclosure, praying at a common family temple, with one gate and one kitchen. The square plot of land (pekarangan) in which the various units. of the house stand is entirely surrounded by a wall of whitewashed mud, protected from rain erosion by a crude roofing of thatch. An old Hindu’s manuscript called Lontar Asta Kosala Kosali is the chief guide to build a proper Balinese house. There are also other manuscripts, such as Lontar Asta Bumi (containing size of land and location a good house), Lontar Asta Dewa & Lontar Wisma Karma (containing the name, shape, and function of each a building), and Lontar Dewa Tattwa (containing clearance ceremony before a house is built). In many aspects of life, those guidance books have been developed depending on the surrounding, local topography. 1. Family Temple.The house temple called Sanggah or Merajan, is the place to worship the ancestor and the Hyang Guru. 2. Sleeping Pavilion.This building usually a large eight-post structure on a high base. A terrace usually attached for receiving guests at family ceremony. 4. Ceremonial Pavilion The east pavilion, or bale dangin is the ceremonial pavilion. The place is where the life rites and death rituals occur. 5. Sakenam The guest pavilion for relatives and children varies in size and number according to the needs. 6. Granary Or the lumbung or jineng is the storage area for rice. 7. Kitchen Or paon is in the south because of the association with Brahma (the god of fire) whose place in the south. 8. Protective Wall Or aling-aling, most behind the gates to deflect the malign influences. 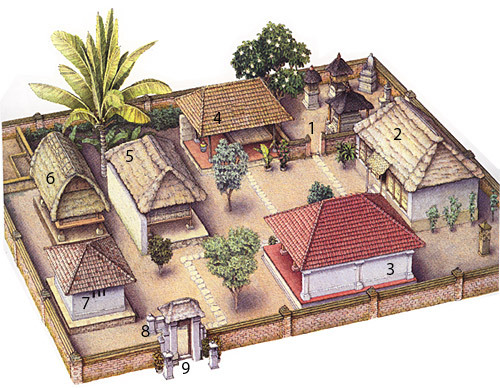 This excellent post, “Balinese House Architecture” shows that u comprehend just what exactly u r speaking about!